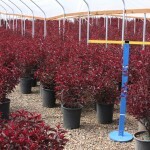 An upright shrub with deep, reddish-purple foliage. The color holds well all summer. 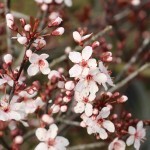 The early spring flowers are fragrant, single, and light pink. It performs best in climates with dry springs. It prefers a site in full sun and moist, organically rich well-drained soil. Use in borders, as an informal hedge, or for screening.